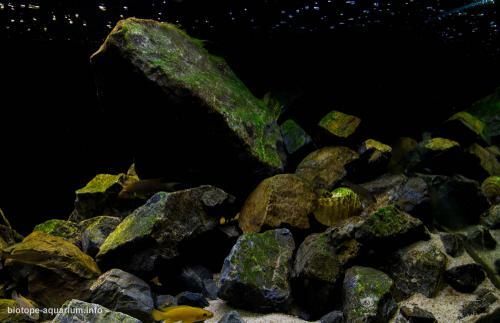 Description of equipment: External filter Fluval FX6, fluorescent lamps T5 2X54W Aquastar. Water parameters: Temperature is 28-29°C, pH is 8.8. Description of the area surrounding the biotope: Kasanga is a city located on the tanzania coast. 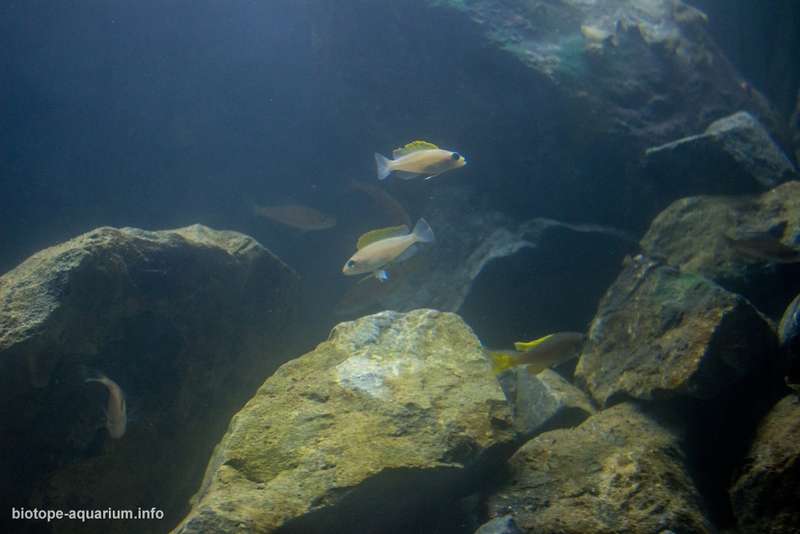 There are many species of fish in the region. Description of the underwater landscape of the biotope: The shallow precipitous rocky habitat. The rocks in this habitat are piled on top of each other, forming a complicated network of caves and crevices. The biocover on the rocks is virtually free of sediment,which allows the algae to flourish, in some places forming thick green mats. Because of this abundance of food, competition for living space is high, and only the strongest and most aggressive species are able to secure a territory. The rocks in this area are piled up on top of each other in such a way that they form many complex caves and cavitiy webs. There is no formation of sediments on these rocks. This enables moss and algae to grow in a rich way on the rocks forming a thick layer on some places. Since there is abundant food supplies by these moss growth on the rocks, the fight in the area is not based on food but more on defending the territory. The one who defends his territory in the most aggresive way remains alive. Cichlids living in this area: Petrochromis species are the biggest and most aggresive herbivarious fish living in this lake. One of the most famous cichlid famililes, Tropheus family also lives which consists of 8 species and many varieties also lives in this habitat. They are rarely seen in depths more than 7 meters and generally lives in shallow waters. 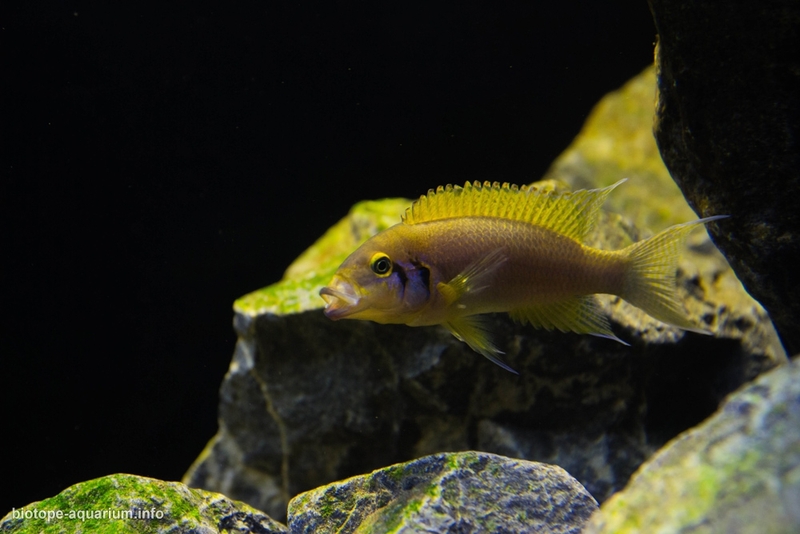 Another popular family, Neolamprologus, which consists of brichardi, pulcher, savoryi, splendens and leleupi also inhibits 4-20 meters depth of this habitat. They are generally seen at the 7-15 meters range and rarely on more shallow waters. Compressed Cichlids: Calvus, Compressiceps and Fasciatus speicies also live here. 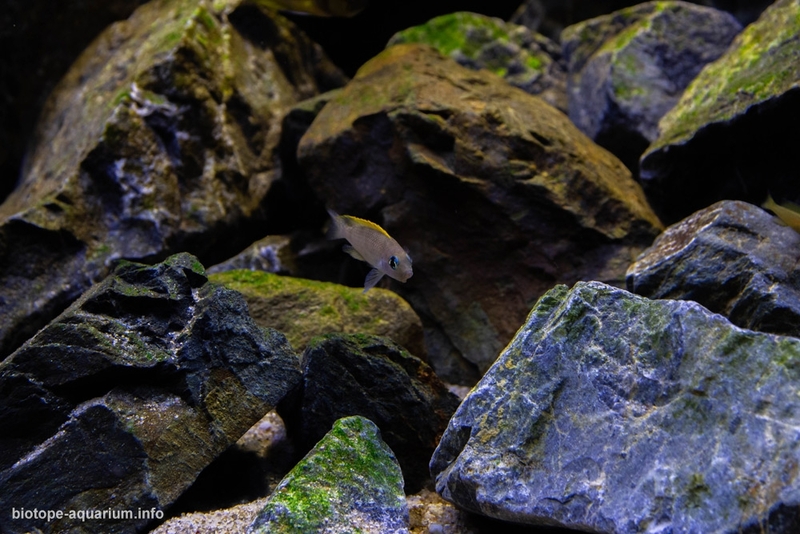 They live away from each other at a distance of 30-100 cms on rocky areas and they search for shrimps, fish fry and other crusticeans and shells that they can feed on among these rocks. Females, inhibit cavities where they can go in, but also too small for males to enter, and lay their eggs there. 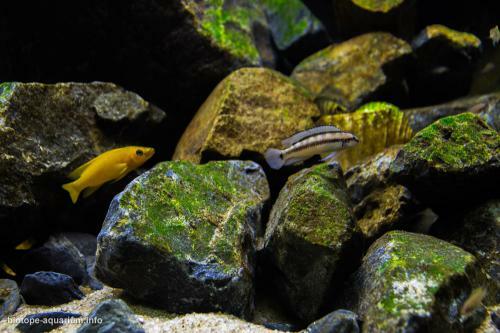 Fish hunter Lepidolamprologus together with Chalinochromis and Julidochromis family members marlieri, transcriptus and dickfeldi species also live in this habitat. Ophthalmotilapia boops species also live on upper levels of this habitat but below the level where waves ocur. Description of the parameters of the habitat: PH of the water is around 9.2, Total Hardness (GH) is between 11-17 dH, Carbonate Hardness (kH) is in the range of 16-19 dH.